The calf raise exercise targets the muscles on the back of your lower legs that facilitate plantar flexion, or ankle extension. These muscles contract to lift your heels off the floor during the upward-movement phase of the exercise, and to control the speed of movement during the downward movement phase. Performing the exercise two to three times per week, progressively increasing the amount of resistance over time, will increase the strength of the involved muscles, helping them to function effectively and potentially preventing injuries. 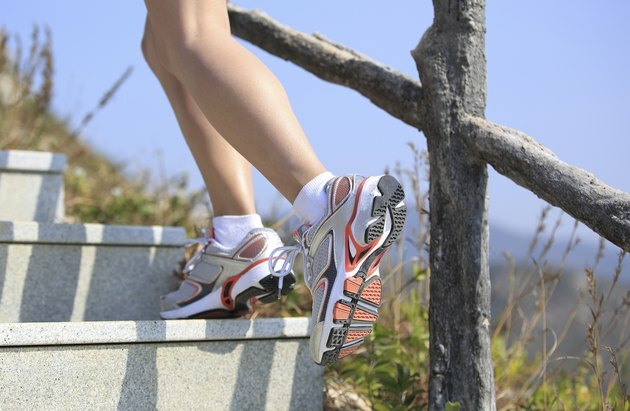 As its name implies, the calf raise exercise emphasizes the calves, which include the gastrocnemius and soleus muscles--the primary plantar flexors. The gastrocnemius, which is the most prominent of the two calf muscles, attaches to your heel via the Achilles tendon and separates into two heads as it runs up the back of your lower leg, with one head attaching to the inside of your knee and the other to the outside. The soleus, which lies underneath the gastrocnemius, shares the same attachment to the back of your heel, but attaches to the upper half of the tibia bone and to the upper third of the fibula bone on top. The flexor digitorum longus and flexor hallucis longus muscles assist the calves when you perform the calf raise exercise. The first muscle lies on the back, inside portion of your lower leg, attaching to the bottom half of the tibia bone on one end and to the base of your second through fifth toes on the other. The flexor hallucis longus muscle, in contrast, runs along the back, outside segment of your lower leg, attaching to the bottom third of the fibula bone on top and to the base of your big toe on the bottom. The peroneus fibularis brevis and peroneus fibularis longus, which lie on the outside of your lower leg, also assist the calves with plantar flexion. Additionally, they work to evert, or move your foot outward, at the ankle joint, but not during the calf raise exercise. The peroneus fibularis brevis attaches to the bottom third and outside half of the fibula bone on top and to the outside of your foot on the bottom. The other muscle attaches to the head and upper half of the fibula bone on top, runs along the outside of your ankle, crosses over the top of your foot and reattaches to near the base of your big toe on the bottom. The other muscles that help the calves with plantar flexion when you perform calf raises include the plantaris and tibialis posterior, which both run along the back of your lower leg. The plantaris is a long, thin muscle that attaches to the outside of your knee, just above the attachment of the lateral head of the gastrocnemius, on top and to the back of your heel on the bottom. The tibialis posterior muscle attaches to the outside, upper portion of the tibia bone and the inside, upper portion of the fibula bone on top; crosses the inside of your ankle; and runs underneath your foot, reattaching at various locations on the bottom.